In 2017, Pew Research conducted an in-depth study of the anatomy of the American workforce, with a specific emphasis on the ratio of immigrant workers in the 400 industries recognized by the U.S. Department of Labor. Of those, there is not a single one that is majority-held by immigrants. But, there are several specific occupations that are dominated by foreign-born workers. 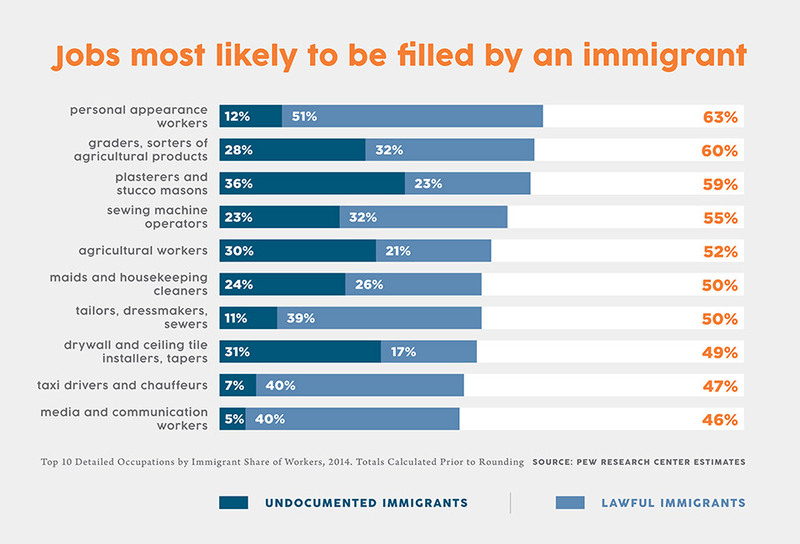 As per the chart, immigrants (which includes both undocumented and lawful) hold a majority of “personal appearance” jobs. This would include manicurists, salon workers, makeup artists, and estheticians. Closely followed are jobs in agriculture, specifically those that involve sorting through and disposal of unsafe food stuffs. Other jobs in which immigrants made up more than half of the workforce included stucco masons, sewing machine operators, and agricultural workers. By the same token, there is no industry in which immigrants of any type made up the majority of the workforce. The closest, private household work such as nannying, gardening, and housekeeping, tops out at 45%, with 22% of the industry made up of undocumented immigrants. Only the agriculture and construction industries were made up of a majority of undocumented immigrants within the immigrant demographic, at 18% and 13% respectively. Often, the argument has been made that immigrants “steal” jobs from native-born citizens, leaving less opportunity for those who were born in the United States to find jobs. But the pattern of immigration is a positive move towards keeping American industries functional with an ever-shrinking workforce. With the majority of Baby Boomers set to retire in the next 5-10 years and the ongoing decrease of the American birth rate, the numbers don’t lie: We need immigrants to sustain all of the industries that are currently being supported by a rapidly declining demographic. In fact, Pew estimates that the workforce will decrease from 173.2 million to 165.6 million by 2035 if immigration doesn’t continue to infuse our mix of working-age Americans. Simply put, the largest population of the workforce--those born in America to American citizens--is shrinking, from 128.3 million to an estimated 120.1 million. U.S. born workers will go from accounting for 74% of workers to 66%. Without thoughtful immigration that allows willing and able workers to come into the United States, the American labor force will decline and leave gaps in some of the most critical sectors of our economy. With the recent wave of deportations and detainment of undocumented immigrants, the agricultural sector is suffering. Mexican immigrants, both documented and undocumented, are leaving the country in larger numbers than they are entering, citing “tougher enforcement of immigration laws and the slow economic recovery here in the U.S.” Mexican census figures report that 1 million Mexican immigrants and their families, which include children who are American citizens by birthright, left the United States between 2009-2014. The U.S. census data from the same timeframe found that only 870,000 Mexicans entered the U.S. This leaves United States farmers in a tough position. With the rising costs of workers , farmers are forced to leave produce rotting in the fields. The worker shortage has left farmers competing for talent, causing a 5% average increase in agricultural work wages. Some producers are even opting to move their farms to Mexico in order to have access to more workers and the lower costs of minimum wage, which currently sits at $5.10 a day across the nation. But despite the new negotiatory power that migrant workers possess, as well as workers’ rights that include 15 minute breaks for every hour of work, few Americans are attracted to the positions. The work is intense, hard on both the body and the spirit, and includes countless hours of bending, kneeling, and hauling 20 pound bushels of fruit while on ladders in the California heat. Equally problematic is the seasonal nature of agricultural work. Many migrant workers move with the growing seasons of produce, forced to pack their belongings and move to different farms as their particular crop begins to ripen. It’s impossible to settle in one place as a migrant worker, leaving the American-born children of migrant workers unable to attend school for many parts of the year and the cycle of immigrant poverty perpetuating. It’s not an attractive lifestyle for anyone, but it is a necessary one. Without workers assisting in the agricultural sectors, food shortages are inevitable. With immigration reform imminent, we can only hope that all sides can find a middle-of-the-line solution that fulfills the needs of both the American workforce and the letter of the law. Undocumented immigration is a problem that must be solved, while still allowing the industries that rely on immigrant workers to remain productive. The IDEAL Immigration believes in the potential of the human spirit and that living in the right environment is crucial to an individual’s success. By optimizing U.S. immigration, we allow for more people to live up to their fullest potential, contributing to a global economy while improving their own quality of life.